Betty Jane Rhodes (April 21, 1921 – December 27, 2011) was an American actress and singer, most active in film during the late 1930s and the World War II era. This swinging singer from WWII was born on April 14, 1921 in Rockford, Illionois to non-professionals. A gorgeous, fresh-faced, blue-eyed blonde doll blessed with a natural vocal talent, Betty Jane Rhodes was initially discovered on radio and was recording by age 8. 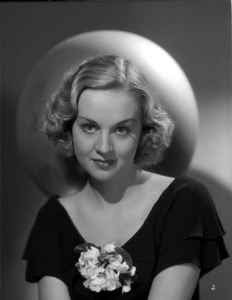 Her promising contralto helped her to earn a contract at age 15 with Paramount and immediately made her debut in _Forgotten Faces (1936)_ initially billing herself as Jane Rhodes. She played Marsha Hunt's kid sister in her second film The Arizona Raiders (1936) in which she sang "My Melancholy Baby". 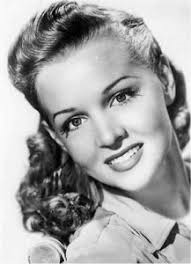 Still a teenager, she played the femme lead in the Universal serial Jungle Jim (1937) opposite Grant Withers's rugged hero. She went on to warble again in such lively film fare as The Life of the Party (1937), Having Wonderful Time (1938), and Oh, Johnny, How You Can Love! (1940) where she sang the popular title song, a hit in 1917 but an even greater success when revived in the '30s. On radio she had her own musical show in 1939, and the following year she and bandleader David Rose headed the cast of the radio programme California Melodies. (1941), however, was one of Paramount's biggest hits, with a superior score by Victor Schertzinger and Johnny Mercer. Rhodes got the film off to a fine start with her sparkling rendition of the title song ("Hey there mister, you'd better hide your sister 'cause the fleet's in"), sung to an audience of appreciative, wolf-whistling sailors. 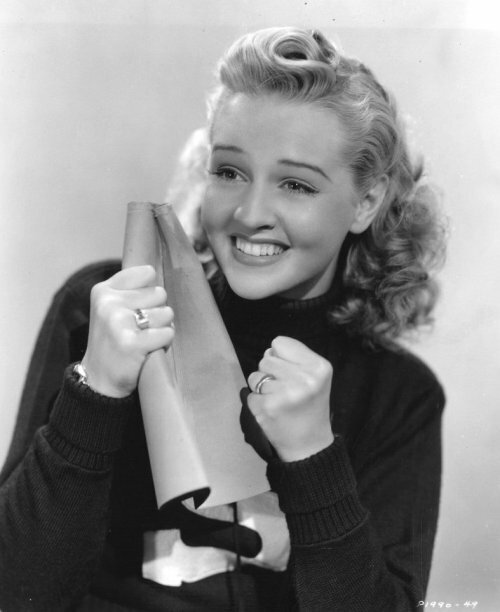 Having been borrowed frequently by other studios, Paramount paid more attention to her by setting her up with the minor wartime musical Sweater Girl (1942), in which introduced the classic "I Don't Want to Walk Without You". An enormous hit, it was recorded by several stars including Rhodes, but the best-selling version was by Harry James and his orchestra, with Helen Forrest singing the vocal. After taking part in the all-star musical Star Spangled Rhythm, featuring Harold Arlen and Johnny Mercer's "On The Swing Shift", Rhodes was given co-star billing with Ann Miller and Johnnie Johnston in Priorities on Parade (1942), in which she and Johnstone sang Styne and Loesser's "You're in Love with Someone Else (But I'm in Love with You)", then she received top billing in Salute for Three (1943) as a radio singer romantically linked with a war hero (MacDonald Carey) for publicity. You Can't Ration Love (1944) co-starred her with Johnston in a weak script about college girls rationing dates because of the wartime shortage of eligible males. 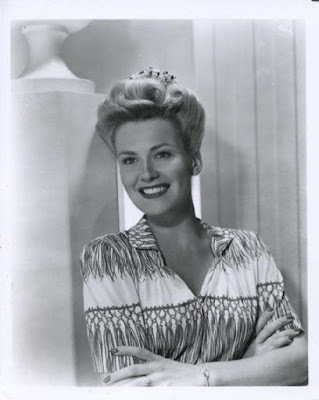 When her contract expired in 1944, Paramount let her go, but she continued a radio career, performing with Fred Allen, Red Skelton and others, and made recordings for Decca and RCA Victor, including two big sellers, "Rumours Are Flying" in 1946 and "Buttons and Bows" in 1948, her recording of the latter remaining in the hit parade charts for over two months. In 1945 she married Willet H Brown, a broadcasting pioneer who co-founded the Mutual Broadcasting System. Rhodes later had her own weekly show on NBC during the 1950s, which aired on Sunday nights. Her appearances, as well as other early television roles, earned her the nickname, "The First Lady of Television." She continued to appear in cabaret until the 1960s. Retired for some time, her husband died in 1993 and left her quite wealthy. She and Brown had one child, and Rhodes became stepmother to his three children from a former marriage. Betty Jane Rhodes died on December 27, 2011, at the age of 90. 19. Why Should I Cry Over You? Betty Rhodes (initially known as Betty Jane Rhodes) was one of those essential 1940s personalities who appeared regularly on radio and records as well as playing the lead and sometimes support roles in a variety of Hollywood movies. With Paramount Pictures she featured in many of their wartime musical productions most notably The Fleet's In while another film Sweater Girl paved the way for her solo recording career. In the latter she introduced the Jule Styne and Frank Loesser I Don't Want To Walk Without You which turned out to be one of the biggest hits of the day but unfortunately her recording was overshadowed by the Helen Forrest version. In 1946, she achieved chart success at last with Rumors Are Flying and her version remained on the hit parade for three months becoming one of the top five best sellers in the USA. 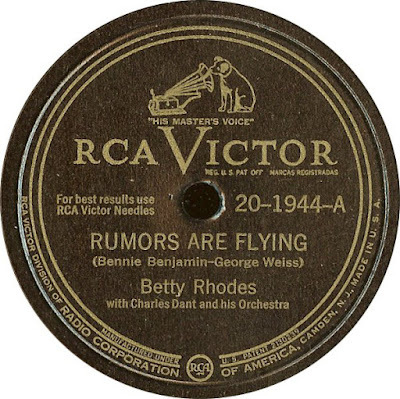 Two years later Betty Rhodes was back in the charts again with Buttons And Bows. Her animated performance on this song gave ers the opportunity to witness a part of her talent not previously realized and this demonstration of versatility and vocal range climbed into the nations top ten best sellers. Almost all of 26 tracks featured here made their first appearance on CD when released by Sepia in 2006.